Who ever says "no" when asked, "Would you like some Parmesan on that?" Savvy restaurateurs and home cooks use this versatile cheese to elevate an array of dishes when serving. It seems that Parmesan has long been prized, appearing in writings from the 13th and 14th century. The London diarist and Parliamentary member Samuel Pepys certainly valued it; he reportedly buried his Parmesan in his garden (along with wine, wisely), when the Great Fire of London happened in 1666. Parmesan crafting is a lengthy process. The curd is placed in cheesecloth and shaped into wheels, which are soaked in a salty brine for about 20 days. Then they're left to age in temperature-controlled rooms. The slightly crunchy, granular texture of Parmesan is caused by little crystals that result from the breakdown of proteins—these are the sign of a well-aged Parmesan. In Europe, where Parmesan is typically made with raw cow's milk, the cheese has a protected designation of origin, which means it must be made in a particular way in designated areas of Italy. It's also produced in many areas outside of Europe, such as Australia, Argentina, and the United States. If the Parmesan you're eyeing comes from Bolgna, Mantua, Modena or Parma, Italy, for example, you'll find "Parmigiano-Reggiano” stenciled on the rind. It's a stronger cheese than most Parmesans produced elsewhere. 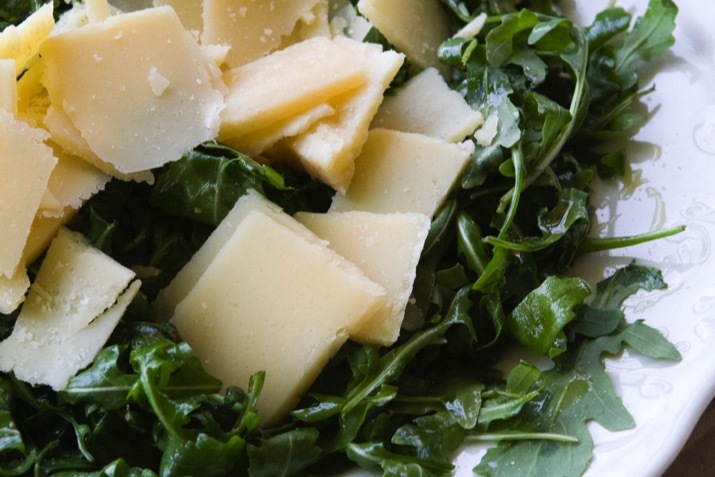 Grana Padano, produced in northern Italy, is a little sweeter. Grana, the Italian word for “grain,” is used to describe Parmesan that's well suited for grating. The longer the Parmesan is aged, the more granular the texture and more complex the flavor. Vecchio Parmesan is aged 18 to 24 months; Stavecchio for 2 to 3 years, and Stravecchione for 3 to 4 years. Parmesan stars on cheese trays (imagine pairing a chewy Parmesan with soft mozzarella, black olives and pears, all drizzled with an aged balsamic vinegar), in salads and appetizers (serve with dipping oils or in mushroom stuffing), in pestos and breads (like these Parmesan Drop Biscuits), and over myriad casseroles. And that's just for starters. Parmesan is standard when serving pizza or pasta—whether or not you've also included it in the dish itself, as in this recipe for Artichoke Parmesan Pasta. Rely on Parmesan in risottos, sauces, mashed potatoes, cream and tomato soups, and with seafood and chicken. (Parmesan makes a delicious breading in this Parmesan-Crusted Chicken.) Use it to transform vegetables, such as these Parmesan Herb Crusted Tomatoes and these Parmesan-Crusted Green Beans. Oregano, basil, garlic, and black pepper enhance the pungency of the cheese. For wines, think Chianti, Cabernet Sauvignon, Barolo, or Zinfandel. A pale or amber ale or lager also pair nicely with hearty Parmesan. For maximum freshness, buy a wedge of Parmesan and grate what you need yourself, just before using. Be sure to save the rind (or even a chunk of Parmesan that's gotten too hard to grate) for flavoring sauces, soups, and marinades. To grate, use a microplane, a box grater, or a food processor. A pound and a half wedge will yield about 6 cups of grated cheese. To store, wrap Parmesan loosely or place it in a plastic container, then place in the refrigerator. If you find your Parmesan wedge has dried out, wrap it in a moist paper towel followed by foil for 24 hours. You can also store it in the freezer, wrapped in an airtight, moisture-proof wrapper. Thaw in the refrigerator. Keep saying "yes" at the restaurant. But treat yourself at home, too, by topping many a savory dish with some Parmagiano.